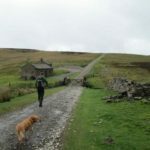 We set ourselves a challenge to walk to one of our favourite pubs the Fox and Hound in West Witton, Wensleydale – a dying breed of pub. 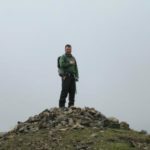 If you’re not familiar with the area than let me tell you that it is quite a trek…but well worth it as Blackie, the landlord has some of the best kept beers in the area! 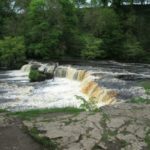 After several glorious Sunny days we decided that tomorrow we shall go on our adventure over the border from Swaledale to Wensleydale and soak up some of the sunshine. We woke up to a rather grey, cold and misty day. But hey ho, we are in England what do you expect! 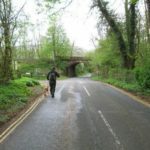 Nevertheless we set off on our walk. 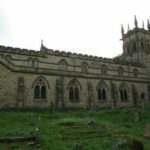 We left the Bridge Inn in Grinton and walked up the road towards Grinton Moor with the impressive St Andrews Church to the right. 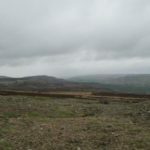 When you reach the cattle grid at the top of the hill we stepped off the road onto the moorland which is signposted as a footpath. 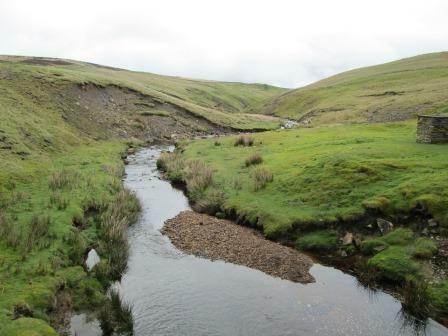 This is the only indication that there is a path there as the footpaths over this particular moor are hard to trace. 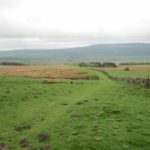 We had a map with us to give us an idea of the route and as a clue it runs roughly parallel to the moor road that leads to Redmire (for a short way). 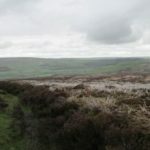 We headed across the moorland, at this time of year (May) it is the ground bird nesting season so be aware of this before you let your dogs run free. 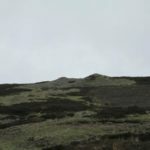 Although the view wasn’t great due to the mist, there was still plenty to keep us entertained; watching the birds hover above us whilst failing miserably to name them and then coming across remains of the lead mining that used to take place in the area. 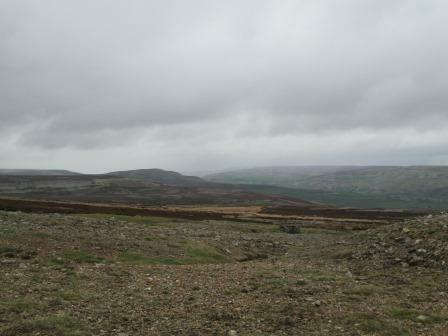 When we reached the top of Grinton Moor the mist began to lift and we could see more of Swaledale. 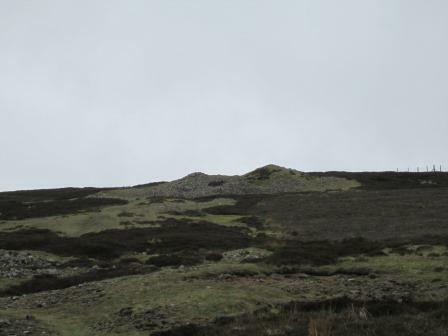 Had a quick stop off at the mounds on top of the moor in memory of Andrew’s friend who lovingly named them ‘Posh’s Paps’ …don’t ask us why he had a far more vivid imagination then us. 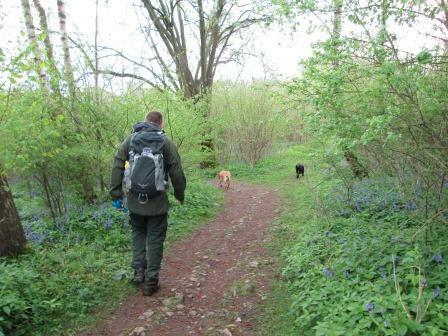 At this point the path is easier to find and leads you nicely to a gate and Apedale. 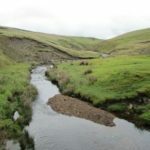 Apedale is a hidden dale between Swaledale and Wensleydale, it is a vast area covered in heather and the odd stream – very beautiful. 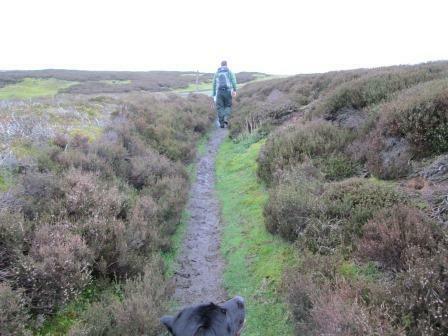 The path through Apedale is very clear as it is the gamekeepers’ route to tend to the moors. 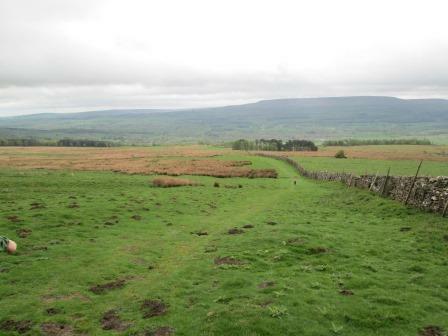 Once you reach Apedale it is pretty much downhill to Wensleydale, on grassy paths. 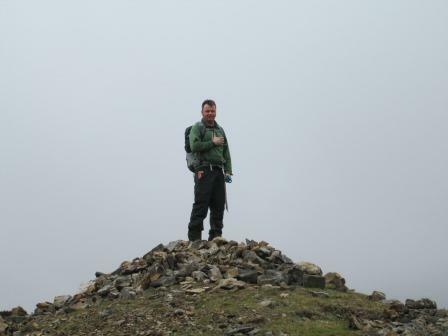 There is a short section that is a little marshy so gaiters might be a good option…I opted for wet feet. 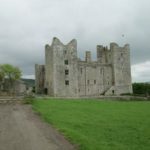 The grassy path leads you through another gate into a path that is bordered by dry stone walls, a little muddy, but this path leads you nicely to Bolton Castle. 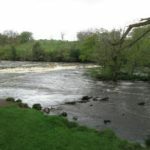 We walked past Castle Bolton, to connect to the foot path to Aysgarth, making a swift stop at the public toilets in the Castle Bolton car park (it’s always worth knowing where the toilet stops are!). 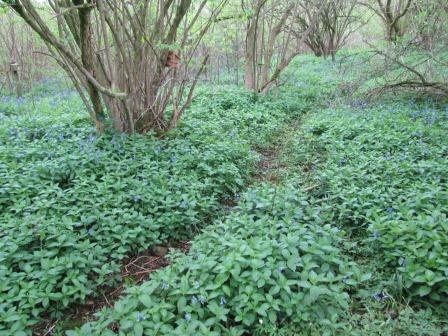 The footpath begins beside the car park, leading through a short woodland section into the farmer’s fields beyond. 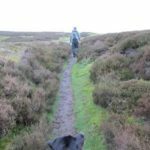 It is worth concentrating at this point as there are two footpaths – don’t make the mistake we made and take the wrong one! 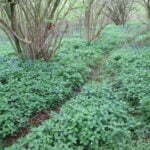 As you leave the woodland area you need to walk diagonal heading towards the dry stone wall. Roughly mid-way up the field you shall see a style. Cross the style and then head diagonal again till you reach the next style within the wire fence. 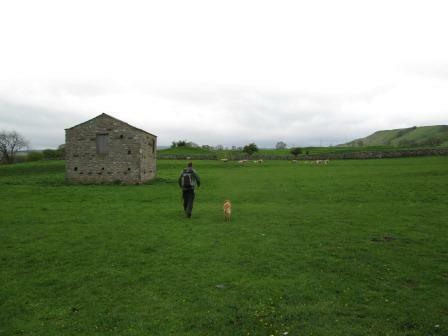 By this point the path has become much more obvious and you can trace your way easily across the fields in the direction of the farm which you can see in the distance. 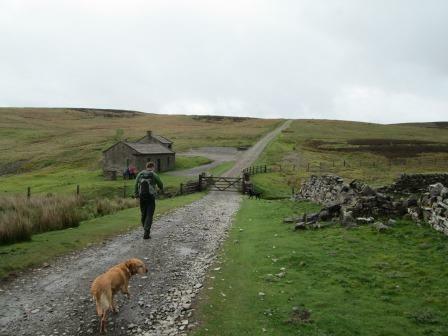 As you approach the farm, keep left and follow the path to the gate that leads you onto the road. 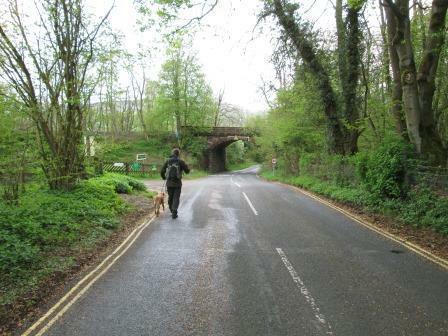 Walk through the gate and turn right towards Carperby. 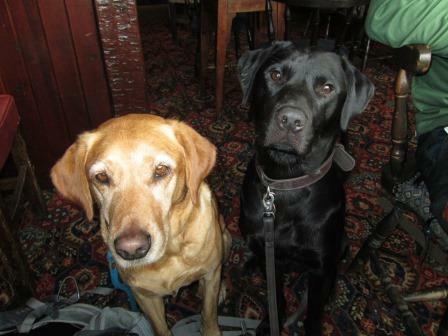 We had a quick pork pie on one of the village benches and a swift pint in the Wheatsheef Hotel Bar (they accept dogs). About 10 yards down the road from the Wheatsheef Hotel you shall notice a footpath sign which leads you between two houses into a field. 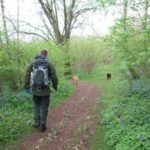 Take this path and follow the footpath across the fields which lead you into a very pretty wood, named Freeholders Woods, which at this time of year is full of beautiful bluebells – my favourite! 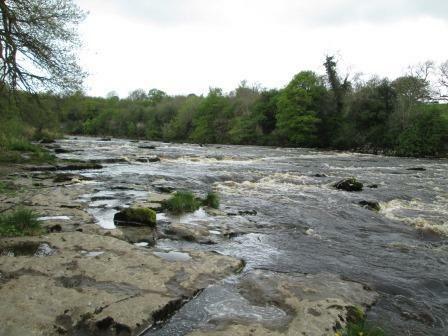 When you emerge on the other side of the woods you are on the road leading to Aysgarth Falls. 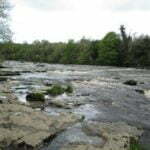 Once on the road, turn left under the bridge and follow it for around 5 minutes until you see the wooden entry gate to Aysgarth Falls. 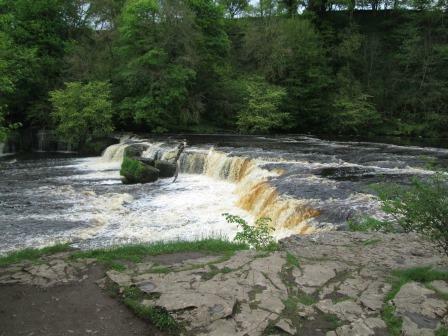 We made a quick stop here to check out the waterfall and finish off our picnic. After our picnic we retraced our steps back to the road and crossed the bridge, which is a great spot to take in the beauty of the upper waterfall. 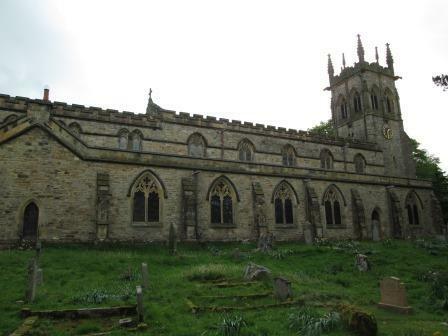 We followed the road round for a few more minutes until we reached St Andrews Church (yes another one). 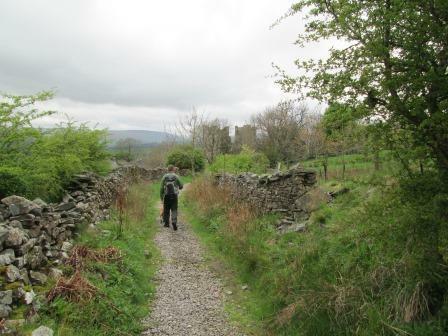 We joined the footpath through the graveyard, a small field and a small woodland area. 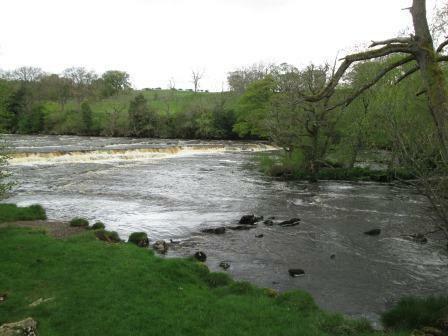 Beyond the woodland area it is a stunning walk along the River Ure for about a mile or so. 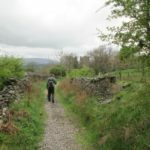 The path then veers you off into a pretty meadow field, and then a short walk on the road (A684) until you can pick up another footpath to West Witton sign posted Templars Chapel. 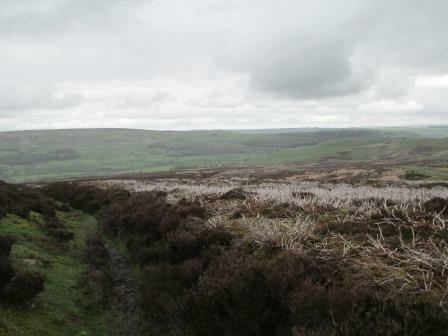 Follow this footpath up the hill with Temple Farm to your left. 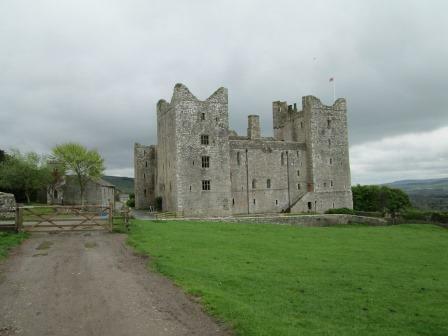 As you gain height you have views of Bolton Castle and where you have just walked. Continue through the gate, the sign post now reads West Witton. You shall see the remains of the Templars Chapel – the graves of the Knights Templar – now protected as a monument of National Importance. 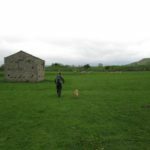 We followed the footpath through the fields until we reached West Witton. 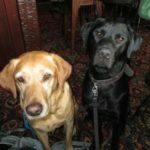 We then called in at the Fox and Hounds for a couple of ales…and a taxi home!